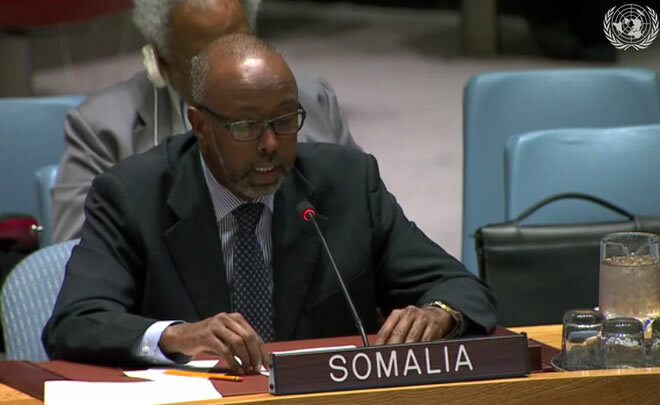 Somalia on Thursday told the UN Security Council not to interfere in its national affairs after expelling a UN envoy who questioned the government’s decision to arrest an al-Shabaab defector running for election. Somali Ambassador Abukar Dahir Osman did not specifically mention his government’s decision to order Nicholas Haysom to leave but he argued that Somalia was in need of support, not criticism from the world body. “The UN and its representatives have a duty, even an obligation, to respect their mandate and to not interfere in our internal affairs, and to let the Somalis control their own destiny,” said the ambassador. In his address to the council, Haysom did not comment on the government’s order to expel him but he renewed his criticism of Mogadishu authorities after 15 people were killed in electoral violence. The council then met behind doors to discuss the fate of the UN envoy. There was no official statement released after those talks. Addressing the council, Haysom warned of a risk of conflict during elections in Somalia’s federal states due to tensions with the central authorities. “We witnessed this during the electoral process in South West State,” he said. “Allegations of interference by the FGS (federal government of Somalia) and the violence which erupted following the arrest of one of the candidates, a former al-Shabaab deputy leader, marred the process and does not bode well for upcoming electoral processes in other regions or for the 2020 national elections,” he added. The United Nations stepped up efforts to persuade Somalia to reverse its decision, according to diplomats. “We are still trying to get clarification,” said UN spokesman Farhan Haq when asked about Haysom’s status. UN Secretary-General Antonio Guterres stepped in to appeal to Somali President Mohamed Abdullahi Mohamed, diplomats said. The Somali government ordered Haysom, a South African lawyer and experienced diplomat, to leave late Tuesday after he wrote a letter requesting information on the legal basis for the arrest of Muktar Robow who was running for the post of regional president of South West State. Robow, who defected from Al-Shabaab in 2017, was arrested last month and flown to the capital Mogadishu. The arrest sparked protests in the southwestern town of Baidoa on December 13-15 that were violently suppressed by Somalia’s security forces, leaving at least 15 dead. In his letter, Haysom requested an investigation of the protest violence and stressed that UN-backed security forces must respect human rights. “We reject the criticism and attempt to rebrand renewed terrorism as ice cream salesperson without redeeming themselves,” he said.